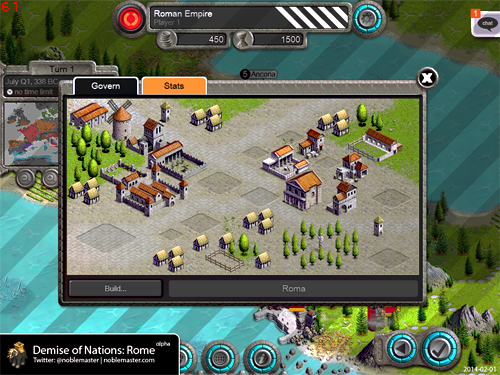 Demise of Nations has been released for alpha-testing today (version 0.8.302a, February 1, 2014). 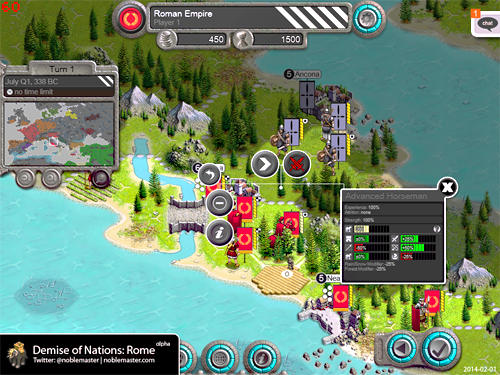 Demise of Nations is a turn-based strategy wargame during the rise and fall of the Roman Empire. Demise of Nations is based on a HEX-map of Europe in the dimensions 127×88 tiles. Each tile is approximately 30 kilometers in diameter. The map currently hosts a total of 22 nations including the Roman Empire, Carthage, Greeks, Sparta, Germania, Celts amongst others. The game is played in turn-based We-Go (WEGO) mode. As opposed to traditional I-Go-You-Go (IGOYGO) mode, all players can enter their turns at the same time. This means the actions you enter will be not directly be executed but will be deferred and executed for the next turn. The units will try to move to the best of their abilities as you ordered them to do, but can fail to do so if for example a unit is destroyed beforehand. WEGO makes a game less predictable than standard IGOYGO games, thus making it appear less preferable over IGOYGO. However, there are several advantages that outweight the negatives. (a) A player doesn’t have to wait for others to finish their turn before being able to enter their orders especially for multiplayer games. (b) Although the outcome of an action is less predictable, it doesn’t provide an unfair advantage to players that move first because everyone enters their orders at the same time. (c) A WEGO game can scale to an unlimited number of players. Traditional IGOYGO games don’t support more than 2-6 players before the game balance is destroyed. (d) Less predictable doesn’t necessarily mean bad. Although a WEGO-system is less predictable, it is more realistic. Like in Real-Life, commands take time to be executed. Orders are executed depending on the situation. Please contact us if you are interested to participate in alpha-testing the game.